Last month I acquired a wonderful mouthpiece which I thought to share – a mint condition block letter Meliphone Bb clarinet mouthpiece, circa pre 1920. This mouthpiece is a rare piece of mouthpiece history, as it bears the initials of two significant French makers: Eugene Bercioux and Charles Chedeville. Meliphone clarinet mouthpieces were made during the very beginning of the “golden age” of mouthpiece production. The firm was lead by Eugene Bercioux, a sadly forgotten giant in the world of manufacture and mouthpiece crafting. Bercioux was a brilliant engineer, clarinet maker, mouthpiece craftsman and businessman, who in my opinion deserves recognition and a place in the history of woodwind manufacture and design. I have done quite a bit of research into this period, and it appears that after WW1 he emigrated to America, where he took up management of the newly formed Woodwind & Co firm in NYC. 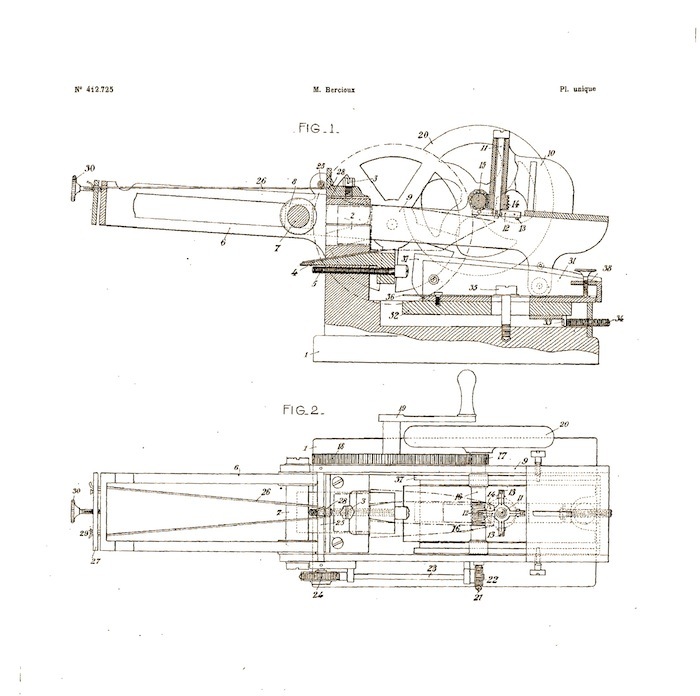 Bercioux devised and patented many elaborate machines for facing mouthpieces, and also patented certain mouthpiece designs. He clearly had a vision of large scale manufacture (clarinet and saxophone mouthpieces), and made this a reality as Woodwind & Co and Meliphone became leading companies in the 1920s through the end of the second World War. Bercioux also branched out into clarinet manufacture, creating clarinets under the Meliphone/Woodwind company name – he also produced a line in his own name. Prior to WW1, there were few major manufacturing firms in France creating consistent, high quality mouthpiece blanks, in large numbers. These early mouthpieces, stamped Steel Ebonite, Bte SGDG Depose, 412725, along with Bercioux’s initials, were some of the first to have real consistency, craftsmanship and attention to detail – also structurally taking the form of the modern mouthpiece. Apart from being used by Meliphone, they were imported by Henri Chedeville in Philadelphia, and other firms such as Vega in Boston (which later became Bettoney), and smaller makers in France. There are not many Charles Chedeville examples stamped this way – I believe those mouthpieces were made later, much nearer to the mid 20s. I have seen examples of the Bercioux blanks, which are in various collections – they are immaculately finished, to a very high standard. The number stamped on these mouthpiece, 412725, has been a topic of speculation, and various stories have passed through time regarding its significance. This number was a French patent (registered in 1912), in Eugene Bercioux’s name, for an elaborate, hand operated facing machine – one of many patents he registered for facing machines during his career as a manufacturer. This particular Meliphone mouthpiece is interesting and rare, as in addition to Bercioux’s stamping, impressed on the underside of the tenon are the interlocking initials of Charles Chedeville. From time to time I do encounter pieces like this, with multiple maker stamping, however rarely Chedeville and Bercioux together on the same mouthpiece. The facing was machined, using template number B7, which is stamped on the tenon (a formatting Bercioux carried into Woodwind) – measuring very near to a Kaspar 13, medium long and medium open. The facing is precise and straight, with clean, even machine markings along the lay and table. The baffle is severely convex and S shaped, so I am thinking perhaps this was created for wind band or dance music – it seems to fit that style, as it was much more open than what was standard during the period. As for its age, I believe near to the end of WW1 perhaps, probably near to the time Bercioux left France. The early block letter Meliphone mouthpieces, although very fine, were generally not finished to the same standard of meticulous detail as Henri Chedeville (Philadelphia) mouthpieces, which were crafted from the same blank during this period. Henri Chedeville was a custom maker, having complete control of his work, while Meliphone was clearly a larger enterprise – quality of detail is often lost in larger operations. Block letter Meliphone mouthpieces are good candidates for refurbishing, as they were not significantly altered internally, so there is usually plenty of room to work with. The later, oval stamp Meliphone mouthpieces are not of the same quality in my opinion, and are often mistaken for the older examples when buying and trading. Charles Chedeville expanded his business in the 1920s, creating the high quality “Artistic Facing” pieces which made him famous – his cousin Henri imported the blanks, as did Bettoney, and other makers in America and France. It is interesting how these pieces are stamped in the same format as Bercioux’s pieces, only with “Artistic Facing” in place of the patent number. His initials appear in the same position on the mouthpiece as Bercioux, the letters stamped over each other. In America, Bercioux kept the formatting of the early made Woodwind & Co mouthpieces very similar, using the STEEL EBONITE, and various American patent numbers which he devised along the way, stamped on the side of the mouthpieces. From my research and work as a craftsman, it is evident that during the 1920s Bercioux and Chedeville diverged with their work and production standards. Bercioux was very much pushing the limits of large scale manufacturing (machining, vulcanising, etc), while Charles Chedeville refined the quality of mouthpiece production into the 1930s, creating some of the finest blanks ever made. Both firms were successful, however Bercioux clearly lost the quality control at Woodwind and Meliphone as the demand increased and the operations grew – also it was early days in the evolution of mouthpiece manufacturing, and methods were more crude and primitive by today’s standards. Chedeville was to fall victim to this later, as would Lelandais following that. This is a natural phenomenon in production, which continually repeats itself through time: high output and more hands working eventually result in the drop in quality of the mouthpiece – especially if the managers retire or die; their knowledge is never completely translated and understand by the workers. For periods in their careers though, all of these men created exceptionally beautiful mouthpieces. Apart from Charles Chedeville’s imprint, another set of initials appear on some of the early Bercioux/Meliphone pieces: A.L. – Albert Lelandais also played a role in that relationship. Just how exactly they operated together is unclear, and will most likely never be known completely – business records from this period are often lost or very sparse, and it is too long ago for word of mouth information to have survived intact. Makers during that period were small scale in comparison with companies today – many worked in the same village, on the same street, or facility, and often were related in some way. It is most likely that all three men worked together for periods, very much in the tradition employed by the neighbouring clarinet makers. I believe Chedeville and Lelandais worked for Bercioux in some capacity, perhaps as apprentices, and expanded their own businesses later into the 1920s and 30s. More study and research is needed, but it is evident that Eugene Bercioux was a central figure in the creation of the modern French mouthpiece as we know it, both as a manufacturer and craftsman – how his name faded into obscurity is a mystery. Did you ever do an article on vintage Boosey and Hawkes Mps? Hi Ian – I am working on that. Unlike Chedeville, there are a fair amount of records remaining from the Boosey archives.